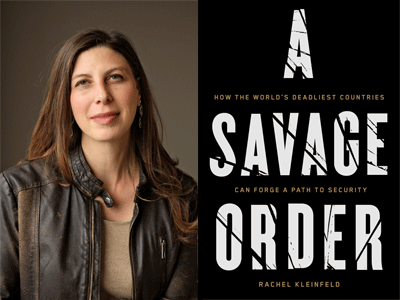 Senior fellow at the Carnegie Endowment for International Peace Rachel Kleinfeld discusses her comprehensive work, A Savage Order: How the World's Deadliest Countries Can Forge a Path to Security. The most violent places in the world today are not at war. More people have died in Mexico in recent years than in Iraq and Afghanistan combined. These parts of the world are instead buckling under a maelstrom of gangs, organized crime, political conflict, corruption, and state brutality. Such devastating violence can feel hopeless, yet some places--from Colombia to the Republic of Georgia--have been able to recover. In this powerfully argued and urgent book, Rachel Kleinfeld examines why some democracies, including our own, are crippled by extreme violence and how they can regain security. Drawing on fifteen years of study and firsthand field research--interviewing generals, former guerrillas, activists, politicians, mobsters, and law enforcement in countries around the world--Kleinfeld tells the stories of societies that successfully fought seemingly ingrained violence and offers penetrating conclusions about what must be done to build governments that are able to protect the lives of their citizens. Taking on existing literature and popular theories about war, crime, and foreign intervention, A Savage Order is a blistering yet inspiring investigation into what makes some countries peaceful and others war zones, and a blueprint for what we can do to help.